Hotel Piazza Bellini, Naples. Piazza Bellini Hotel Naples. If you want to spend an exclusive and refined stay in the heart of Naples, Hotel Piazza Bellini is the perfect choice for you. This splendid structure, inaugurated in the April of 2007 and recently restored, enjoys a strategic situation. It lies in the heart of the historic city centre, at a few steps from the 2 main underground lines and near the major museums, archaeological sites and attractions of Naples. Moreover, in the neighbourhood of the hotel our guests can find numerous typical restaurants, literary cafés and art galleries. Thanks to its optimal situation, the hotel enjoys splendid panoramic views of the city. The Hotel Piazza Bellini is housed inside an ancient 16th-century historic palace. It is characterized by the union of a contemporary design with the precious architecture of the aristocratic 16th-century palace. 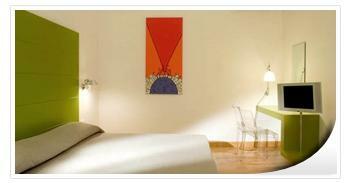 The structure places at its guests' disposal 48 welcoming and comfortable rooms located in 6 floors. All the rooms enjoy splendid views: some rooms overlook the internal court of the hotel, others overlook Piazza Bellini or the hill of Saint Martin, while from the rooms of the sixth floor you can admire the Vesuvius. The Hotel Piazza Bellini boasts in the entrance a marvellous court with columns and a fountain with some 18th-century busts, where the vault rooms of the reception and the breakfast room give onto. Moreover, for those who have to organize business meetings or conferences, the hotel has at its disposal 2 meeting rooms, which can receive up to 70 people. Come to spend a unique and unforgettable stay in Naples at the Hotel Piazza Bellini, where our guests can enjoy the best comforts and services at competitive prices. Finally, the hotel is provided with further comforts and services, including: free internet connection, internet point in the hall of the hotel, large rooms with queen size beds, check-in service at 13.00 and check-out at 11.00, buffet breakfast from 7.30 to 10.30, reception service 24 hours per day, left-luggage service and shuttle service to and from the airport, central train station and port (for money and on booking). The hotel has an agreement with a garage at 500 metres from our structure for a guarded parking.